The Chinese Horoscope 2019 for Monkey predicts a favorable period between May and August to live and perform new personal and professional adventures. On the other hand, during the month of September, intellectually, you will not be at your best, a fact that will motivate you to worry only about professional issues. It is also necessary to add the divine help that will be present in the first five months of the year of the Pig. Without a doubt a favorable moment that, together with your optimism and potential, will lead you on the road to success. Between June and September, the Chinese Horoscope 2019 for Monkey indicates that it will be better to avoid all those commitments that you know you will not be able to fulfill, a priori. The best thing you can do is to focus on getting what you want without getting sidetracked by irrelevant issues. Those who were born in the years 1908, 1920, 1932, 1944, 1956, 1968, 1980, 1992, 2004 and 2016 are part of this Horoscope. The friendships of the Monkeys will make you part of social events in which you will end up knowing a great love. That is why you can’t miss, for any reason, any moment that arises to meet new people. About the middle of the year it’s a good time to establish marriage commitments for upcoming weddings. The mistakes of the past will be a good reminder to know what does not have to fall back during new relationships. In couples already settled, the first four months of the year will be lived intensely and generate a very positive result, such as the subsequent birth of a child. In the case of looking for a job in which you are very interested, perseverance and illusion will end up achieving the objective. At the professional project level, it will be a great moment to start a new adventure sharing the challenge with more people. It will also be a time to analyze past experiences and think about turning them around according to the new knowledge acquired. As far as earning money is concerned, February and May as well as September and November will be very beneficial for this. It is also a good year to apply for wage increases at work. New friendships will broaden your social circle and will serve you well in the future. Moreover, the recent acquaintances, who apparently will only be new friends, will later come in handy for personal and professional matters of various kinds. 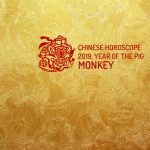 Therefore, the Chinese Horoscope 2019 for Monkey indicates a year in which one’s own initiative and the help of others will serve to achieve both present and future goals.